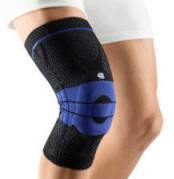 This patella strap provides the ideal in therapeutic support, conforming compression without restricting circulation. Use this support to treat symptomatic pain from Chondromalacia patella Syndrome (runners knee), Patellar Tendonitis, and Osgood-Schlatter's disease. Strap applies uniform compression which helps guide the patella and improve tracking. aids in the diagnosis and treatment of patellar instability and patellofemoral pain. permits delay or avoidance or surgery. reduces pain in painful patella syndrome. prevents subluxation and dislocation of the patella. Controlling the patella is the biggest challenge when dealing with patella femoral dysfunction. The "Q" (Quadrant) Brace gives you one more tool in the rehab program. This multifunctional dynamic brace not only offers multi-directional pressure to the patella for tracking problems, but also works to treat patella tilt. Helps strengthen the kneecap mechanism by applying pressure on the tendon above the kneecap as well. This tends to reduce the forces of the quadriceps on the patella tendon and erosion of the under surface of the kneecap due to a possible misalignment of the quadriceps (Q-angle). KNEE PRO-TEC is a means of prevention and treatment for Tendonitis, Chondromalacia, Patella Instability and other knee ailments. Helps reduce inflammation, irritation and cartilage wear around and under patella. The Palumbo Patella Stabilizing Brace creates a dynamic, medially displacing force to the patella and allows functional activity while providing stability throughout the full range of knee motion. Reduces patello chondromalacia and arthritis by dissipation of forces.